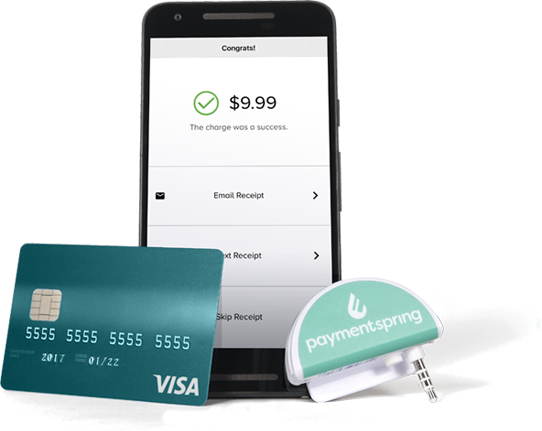 PaymentSpring’s mobile payment solution does what the others should, it works with your online dashboard, not against it. Every payment or donation that passes through PaymentSpring Gateway shows up in your payment dashboard as one glorious grand total with an itemized list for detailed tracking and reporting. Webhooks are handy notifications that can be customized and sent to you via text or email, so you’ll be aware of exactly what you want to know about your payment processing in real-time wherever you may be in the world. Tools of the mobile payment trade. The first swipe device is on us. Just let us know where to send it and if you’d like a few extra—yup, you can run multiple swipe devices at the same time. Double the payment processing, double the fun! Take PaymentSpring’s Gateway along with you for the ride. No mileage restrictions here—test-drive the all-in-one payment gateway for free for as long as you’d like. Sign up is simple, and once activated, you can request your free mobile card reader to collect payments and donations on the go.